Posted on May 19, 2014 by Mark Pajor. This fall, students will take their seats in the Fredric G. Nearing Family Classroom, located in the south wing of the second floor of the ECE Building. The classroom is named in honor of Fred Nearing, a 1943 graduate of the department and veteran of electronic sales, who has given $500,000 for the building campaign. Supporting the ECE building project was a means of spreading some of that good fortune to students and faculty who are pushing the forefront of electrical and computer engineering. 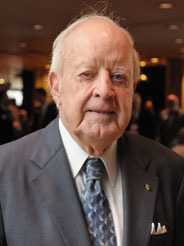 In 1997, Nearing and his late wife, Betty, also established the Fredric G. and Elizabeth H. Nearing Endowed Professor of Electrical and Computer Engineering. When Nearing was a student, Everitt Laboratory had not yet been built, and most of his departmental classes were taken in the electrical engineering laboratory and annex, bordering the Boneyard Creek, where the Bardeen Quad is located today. “There were a few buildings around,” Nearing said with a laugh. “My graduating class was, it seems to me, the low 40s—40 to 45.” Last year, more than 350 students graduated from ECE ILLINOIS with bachelor’s degrees. After graduating from the university, Nearing worked for Western Electric, writing technical data for field engineers, including information about the radar bombing system of the B-29 aircraft. At the end of World War II, he was the third youngest of 650 field engineers. “My guess is that they probably averaged 15 years experience each. Here I was right out of school,” he recalled. In 1949, Nearing became a commissioned sales representative for Hewlett-Packard, then a 10-year-old company with 200 employees (they employ more than 300,000 today), and he later became the Midwestern sales manager for Hewlett-Packard. Nearing and several other sales representatives from Hewlett-Packard banded together in 1972 and formed an independent sales company, Electronic Instruments Associates (later renamed Electronic Equipment, Inc.). He worked there until retiring in 1989. The old electrical engineering buildings that Nearing took classes in were removed in the mid-1990s, at the time Grainger Library was completed. Now, with the opening of the new ECE building, a third generation of electrical and computer engineering structures will have been used since Nearing’s time as a student. “Lots of changes,” Nearing said. While some things have changed dramatically over the past 70 years, others are timeless. Like Nearing, the students who come through the department are diverse and talented, in engineering topics and beyond. Nearing was a gifted clarinetist in the Marching Illini and was the first chair concert clarinetist his final two years. Even now, at 95, Nearing is active and energetic, doing his own gardening and yard work at his home in Barrington, Illinois. When others ask him how he stays so healthy he tells them about the salubrious effects of gardening, sure, but also of his alma mater. Nearing has served on the ECE and university alumni boards and also on several advisory boards. For his years of indefatigable support, he was honored with the Lou Liay Spirit Award at the 2012 homecoming, a university honor for a distinguished alumnus. The Frederic G. Nearing Family Classroom, too, is a testament to his unflagging spirit and commitment. For more information, please see the full story on the ECE ILLINOIS website.